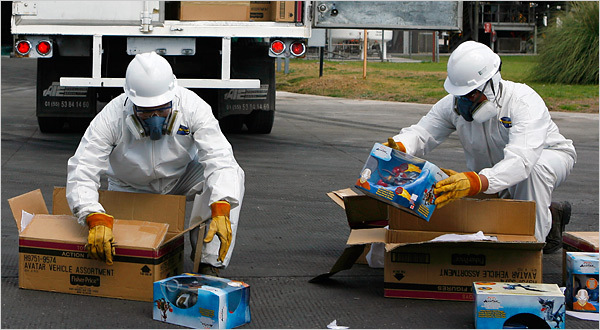 2007 will go down in history as the year when toy safety was no longer assumed by parents in the United States. Gone are the days when parents blindly selected any toy from the shelf of a big box store and thought their child was protected from lead and other heavy metals. This year has been plagued by recall after recall, and unfortunately, children have been injured by these unsafe toys. The following is a summary of recent news on toy safety to end our year. The current draft of the Senate bill would do many of the same things the House-passed version does, but would also allow state attorneys general to sue to enforce federal product-safety laws, protect employees who report safety law violations, increase the civil penalty cap to $100 million, and give industry less time to comply with the lower lead standards…Meanwhile, presidential candidate Barack Obama went even further yesterday by calling for a ban on the import of all toys from China. Well, the results are in, and of the 479 items tested, 56 tested positive for lead, 47 above the 40 parts per million maximum recommended by the American Academy of Pediatrics. Nine additional items tested positive for cadmium, another toxic element…. On December 11, the Vancouver Sun, reported on the appalling working conditions for many Chinese toy manufacturers, which reminds us, it is not only our own children’s safety at stake with dangerous toys. The story features Li Chunmei, who literally worked herself to death in a toy factory. This was the busy season, before Christmas, when orders peaked from Japan and the United States for the factory’s stuffed animals. Long hours were mandatory, and at least two months had passed since Li and the other workers had enjoyed even a Sunday off. But you can’t solely blame the Chinese for such working conditions, as 60% of imported Chinese goods come from western-owned and operated factories. So exactly what happens to all of the recalled toys? As I wrote about previously, some of these toys remain on shelves are are being sold on Ebay; however, some of these toys are being destroyed in toxic waste incinerators in Mexico or being stored in 55-gallon drums. Some of these unsafe toys are even being shipped abroad to be resold! Furthermore, there are no federal laws or regulations against reselling recalled toys, and Ebay is monitoring auctions to try and keep recalled toys off of its site. According to the New York Times, the return rate for recalled toys is very low with approximately 80% of toys remaining in family’s homes. It has long been the case that product recalls generate dismal results. In the past, recalls have brought back 18 percent of products, on average, but low-priced toys and trinkets are returned at even lower rates — often less than 5 percent. It is my hope that none of the toys your children received for the holidays will be recalled, and that they meet the highest safety standards. One benefit to all of the news on toy safety is that change will hopefully occur, and there is a renewed interest in small, wooden toy manufacturers. These people’s hobbies have turned into businesses, as parents seek out toys they can trust (see “You Think Santa is Busy? Talk to a Wood Toy Maker”) The best advice for any parent is to get to know the person making your children’s toys, which is sort of hard to do if they live in China.